So what do you think that it takes to be a judge of food? Is it a love of the food in question? A knowledge for the food subject at hand? The ability to put aside personal dislikes in order to look at a product without bias? If you said to all three then yes you'd be on the right track. Food awards are hotly contested and we've all heard of the judging tales of collusion, discussion and bullying where dastardly deeds have taken place in order to secure a coveted gold medal. But how strict are the standards or criteria when judging? 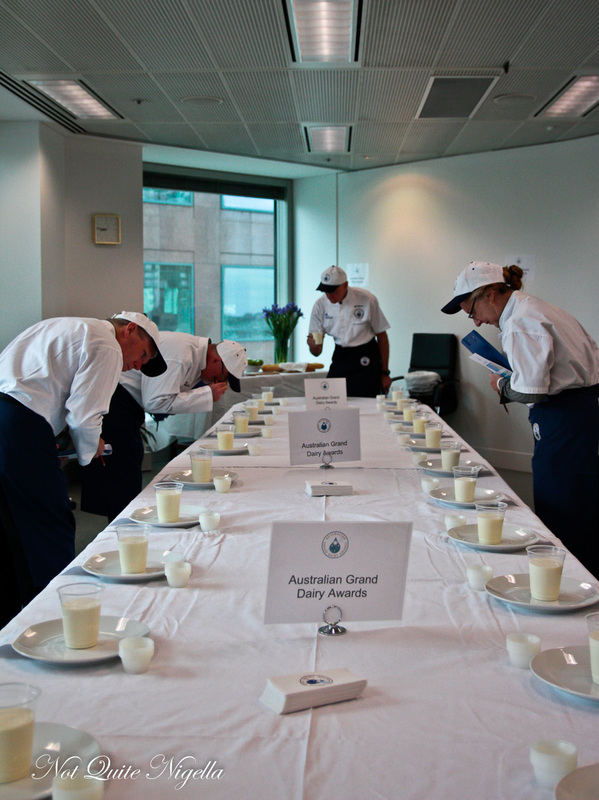 The Dairy Australia gold medal is one where ten judges from Australia and around the world gather to contemplate the dollop of a yogurt, the culture of a butter and the size of an ice cream's crystals. The dairy used in the product must be Australian and entry is free. Neil also emphasises that whilst they judge for perfection within the category, they also look at it from a consumer's point of view as ultimately, that is who is buying the product. First I'm given a lesson in dairy judging. 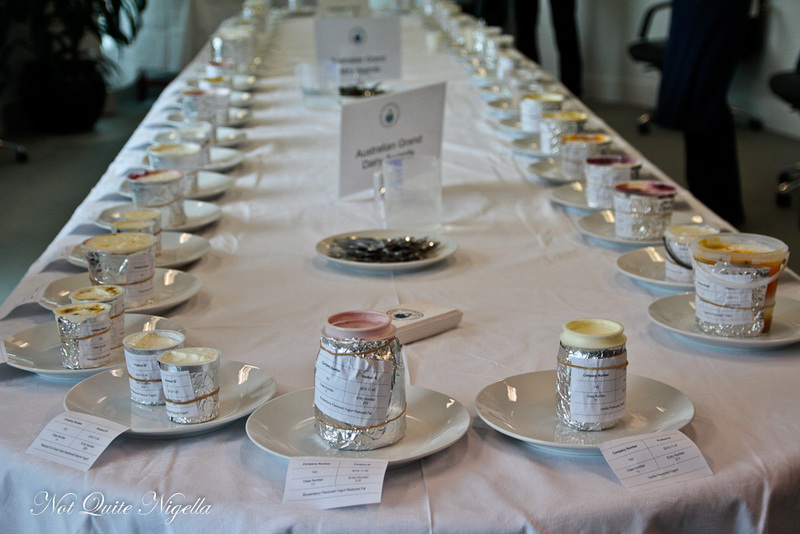 Each judge has gone through comprehensive training in order to properly evaluate a product. The dozen judges offer their services for free and it is an intensive day of testing that they will undergo, no matter how fun it may sound. At each judging there labels are covered with foil and unless the packaging is distinctive, then they are judged within the pot that they are sold. Customarily tasting starts from the mildest flavoured item to the strongest so we start with milk. There are several milks in front of us. Some have a stronger "cooked" aroma than others which comes about because milk is cooked at high temperatures to pasteurise it. There's a big difference with the textures of skim and full fat milk and even though everyone has their preferences, they still must judge according to the category that is, is the skim milk being tasted a good version of skim milk? Neil stresses the importance of the fact that there is no discussion whatsoever. Normally within judging panels, there are three judges at a maximum and it can be discussed with the most vocal judge potentially steering the decision. Here not only are there at least ten judges but the top and bottom scores or outliers are removed from the final count. Neil helped develop the protocol for judging saying that he wants a judging to represent independent thoughts. The scores are broken down into 10 points for flavour and aroma, 6 points for texture and body and 4 points for presentation (appearance and colour). 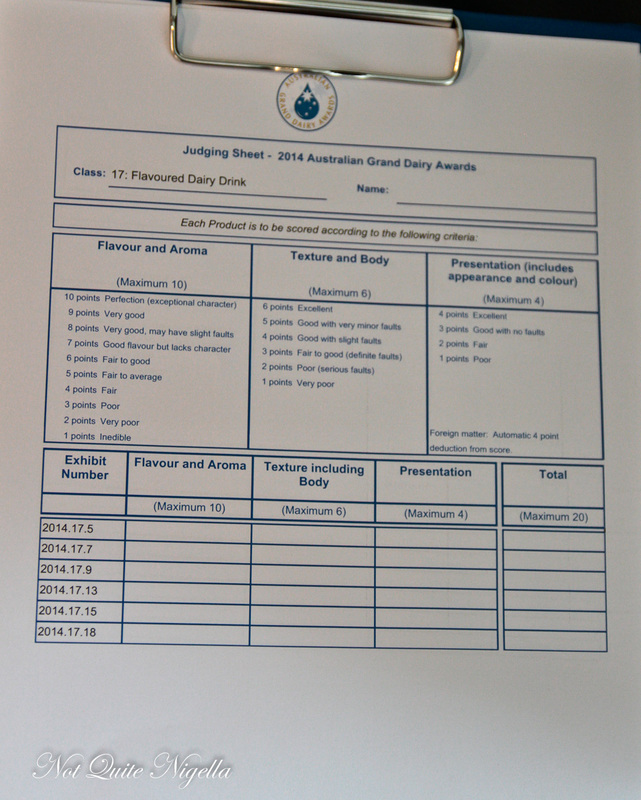 The judges themselves are a mixture of professionals in the dairy industry. 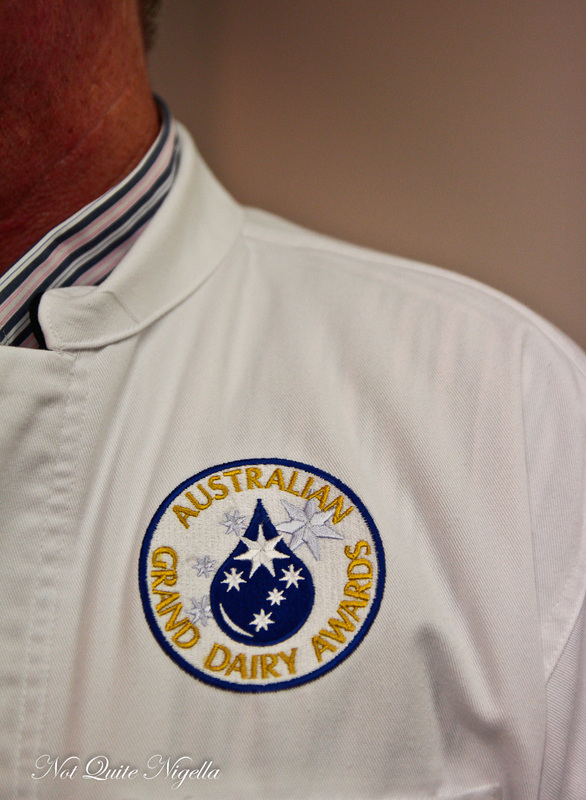 There are chefs, dairy technologists, cheesemakers and dairy producers. Because some of the categories have so many entries within each, these are split into two. An example is the ice cream and gelato category where there. The judges are split into groups of two. One group of judges narrows down the top six ice cream of that group and the other group of judges narrows down the top six or so gelatos. The top six are then given to the other group of judges to determine the best of the group so that all of the judges are given a say in each category. At the end there will be one grand champion and nine category champions. 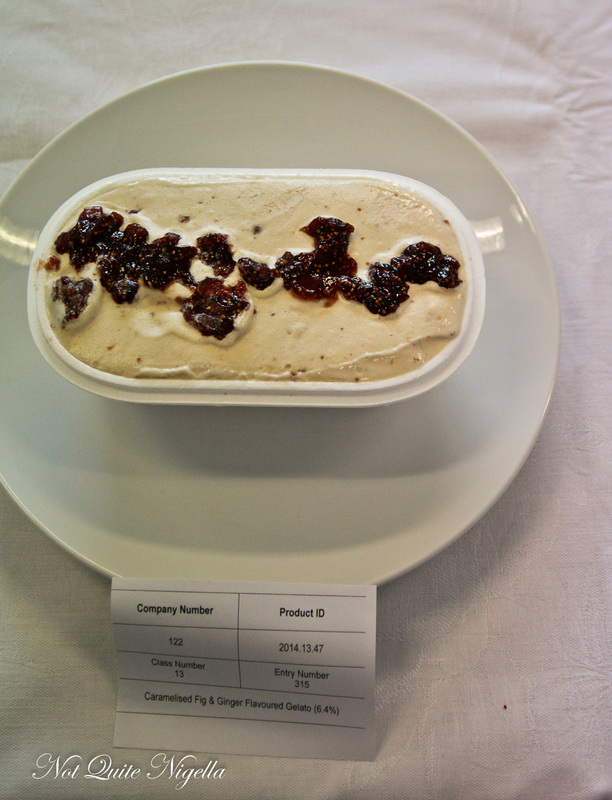 The grand champion is the top product based on points across any of the categories. And if the scores are too low, then no prize is awarded that year for that category. After that, the brand can put the medal on the packaging for a term of up to 5 years. Which brings us to the milk in front of us. Unlike olive oil where you aspirate the oil over your tongue, Neil instructs us to taste. "First, sense used is the sense of smell by smelling the product. Next a small sample of the product is then placed into the mouth and converted into a slurry and taken on a journey around the entire palate to ensure all taste buds are treated to the experience." "The breathing at this stage should be circular in through the mouth and out through the nasal passage to give and aromas from the warmed up sample a second run over the receptors in the nose. This should continue until just after the sample is discarded (leaving a thin film of product on the palate)"
We take a look at yogurt. 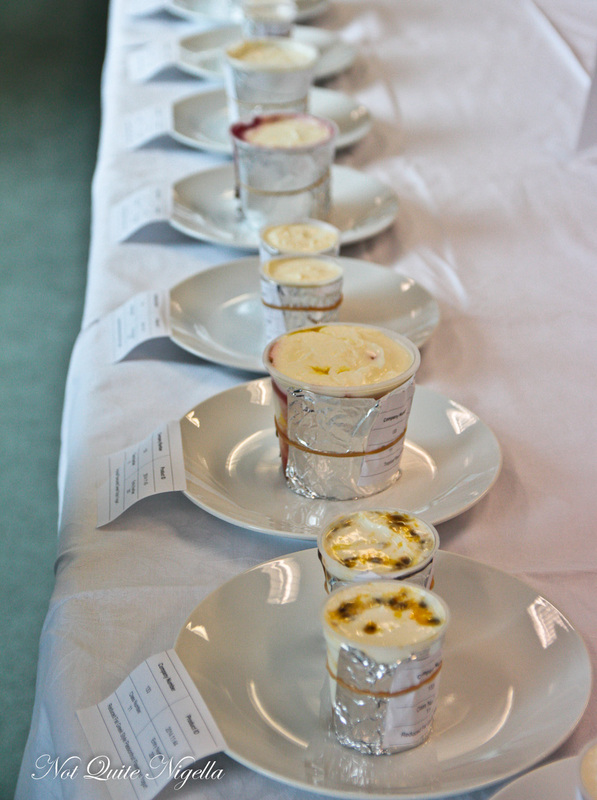 We first try a non homogenised yourt which is obvious from the different colours and the thick layer of cream on top. He tips the yogurt to the side and examines it for free whey which is clearish liquid that comes from the pot. Neil instructs us not to judge the yogurt on the first spoonful in which we get some of the cream and yogurt because the rest of the yogurt will not have the same ratio of cream to yogurt. He looks for the yogurt tartness and culture taste. Cleansing the palette is done through slices of baguette bread which scours the tongue and green apple slices which refreshes the palette. 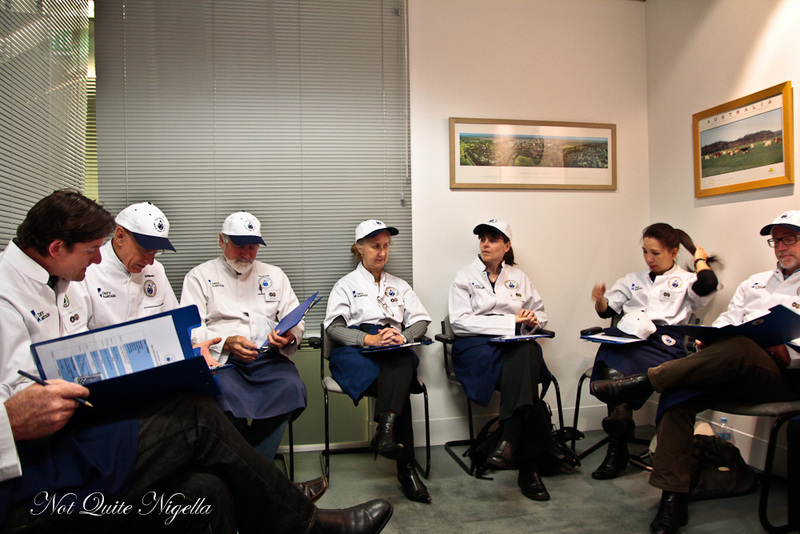 At 8am the next day all of the judges assemble in the briefing area. We don white coats and caps and tie our hair back if it is long. We also have to make sure that we haven't used any perfume or strong smelling hand creams. The bathrooms have an unscented Sorbelone cream for us to wash our hands with. 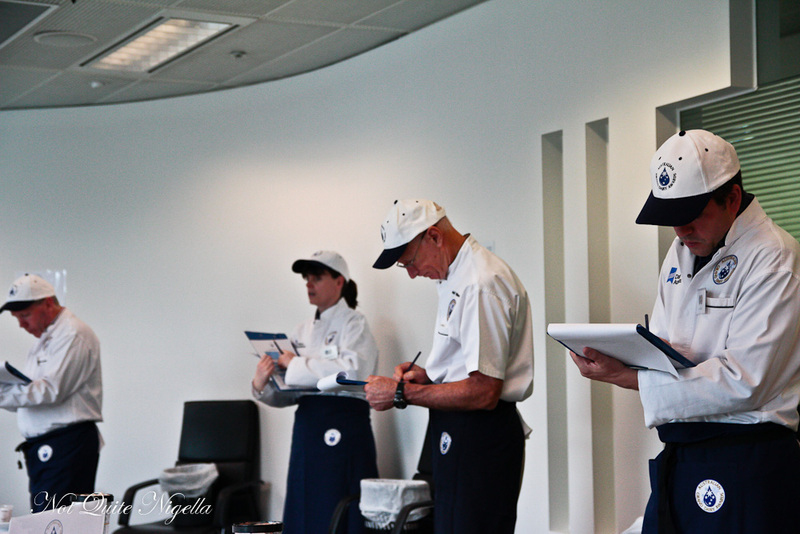 We take our clipboards with judging scores and Neil explains to us the process of judging. Our group of 13 thirteen judges is split into two groups, one with the head judges leading each. 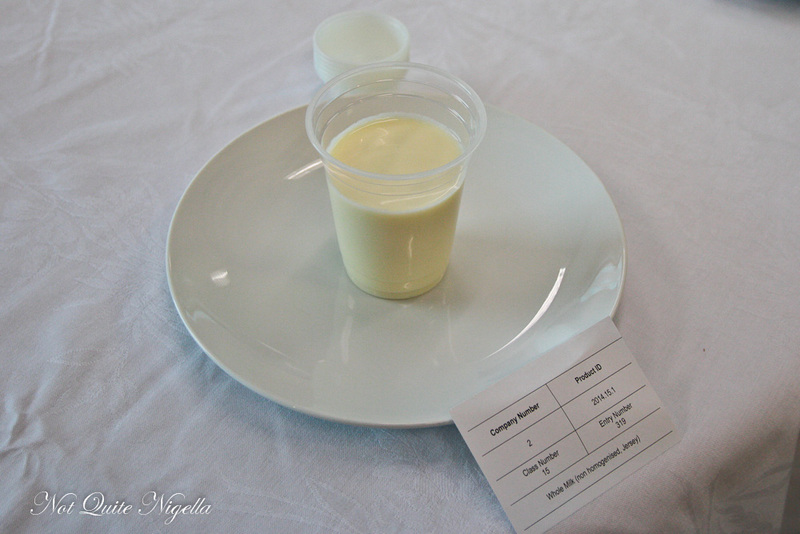 I am in Neil's group where we will be testing milk, flavoured yogurt, ice cream, natural yogurt, butter and dairy dips. Judges are not allowed in the preparation room as we may see labels and other identifying marks. 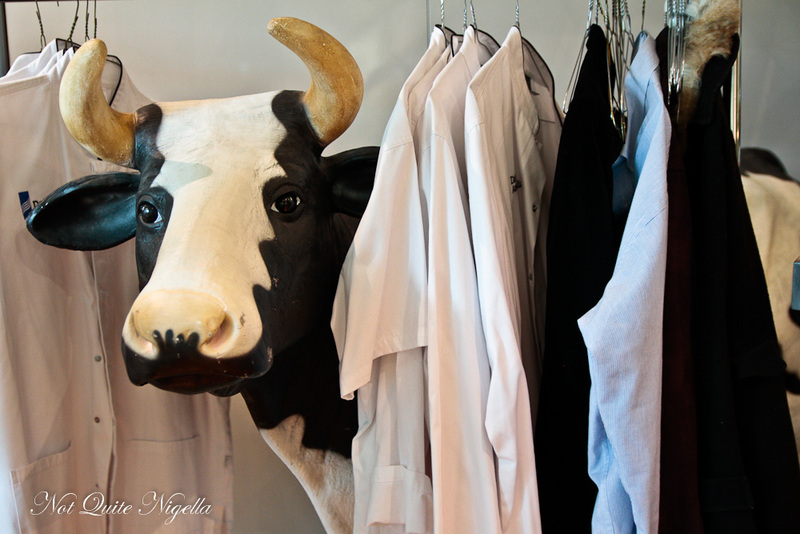 We walk past the preparation room into the board room aptly called the "Friesian Room." There is one steward in the room during judging who oversees things and tends to any needs. The judging room temperature must be set between 15-18°C/59-64°F with uniform lighting across all samples. At the back of the room is a display of still and sparkling water at room temperature as well as the crusty baguette and green apples. The table is set up with 22 types of milks. All are full fat milks, some UHT and they are marked with the variety of milk and any other distinguishing features which may impact our judgment of the milk. For example, if the milk is not homogenised, we can expect a different texture to the milk. 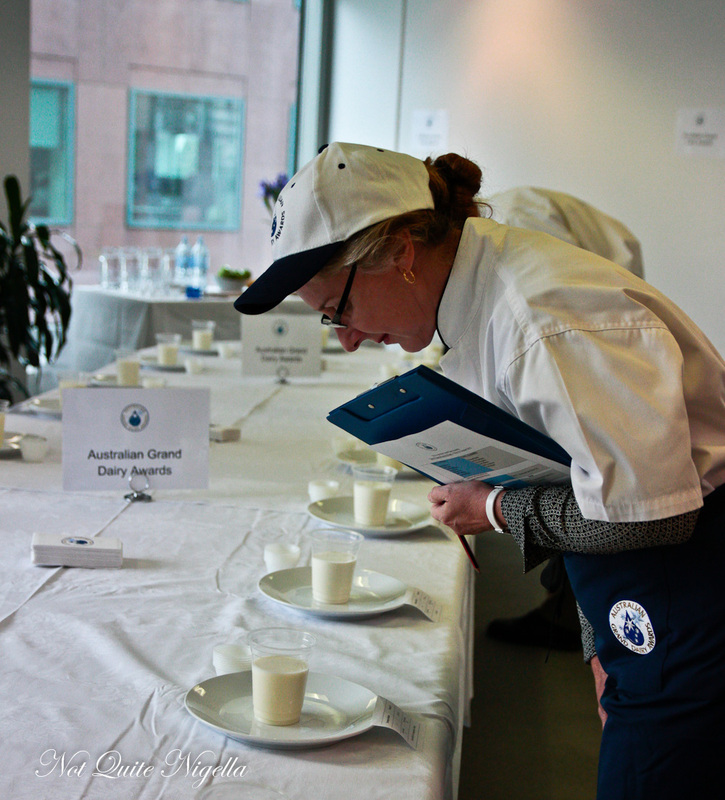 We wait a few minutes while the judges walk around silently looking at the appearance of the milk. They are all displayed in plastic cups and we are to pour a little into a small cup and then taste it and spit it out. There is no swallowing allowed and we are to spit into each of the spittoons which are placed around the tables high on chairs. 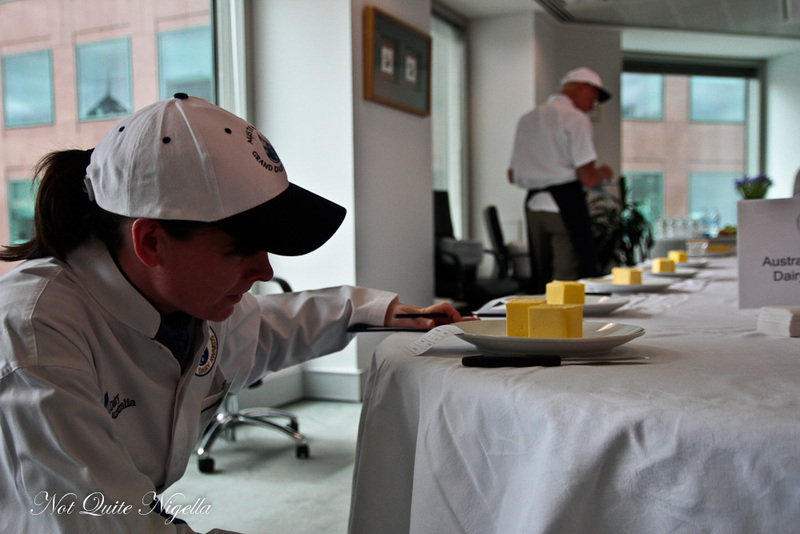 After discarding the samples,judges are to wait for 30 seconds to see if any other flavours appear. Unlike other judging processes, there is to be strictly no discussion and reactions to tasting a sample must be kept expression neutral. Discussion however can take place after the score sheets are handed in. Back to the milk samples at hand. We're starting at the mildest flavoured item but it is also one of the most similar. Or is it? Certainly, in terms of appearance, there is very little to distinguish one milk from another. One sample had a series of bubbles on top but the rest looked very similar. But in terms of aroma and flavour, there is a difference. Some are strong in flavour and aroma, some very little, while surprisingly, some had little aroma but more flavour. 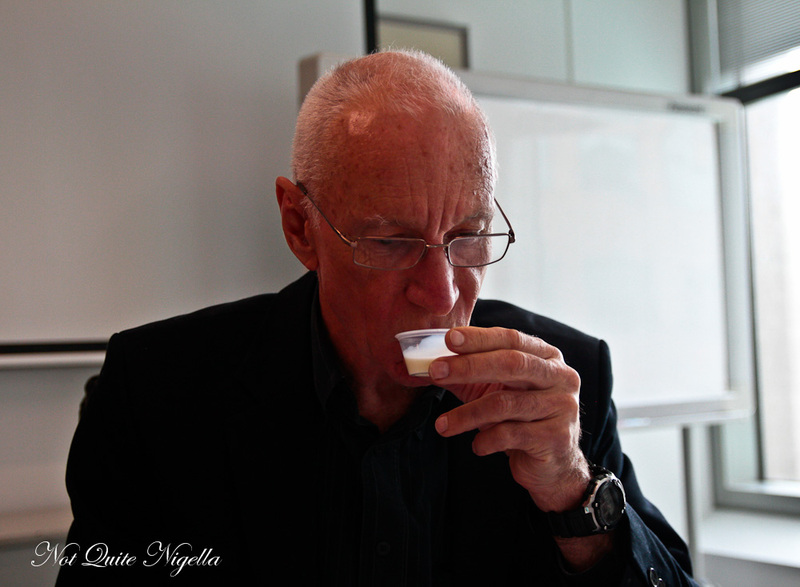 We go around and taste each sample, spit it out and then judge the milks. After handing our scoring sheets in, we go downstairs to the briefing room. At first people are hesitant to discuss their preferences but as the day goes on, more discussion takes place. 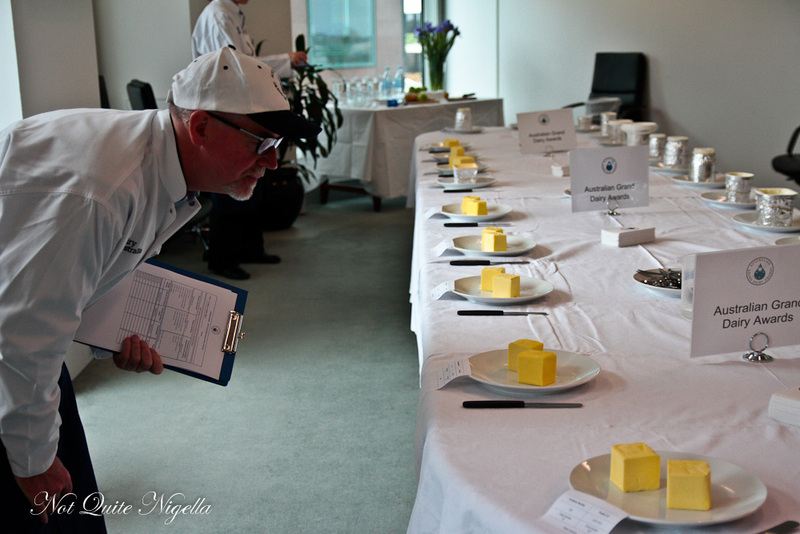 At each judging, there is an overseas judge and this year's is Spain's Oriol Urgell. 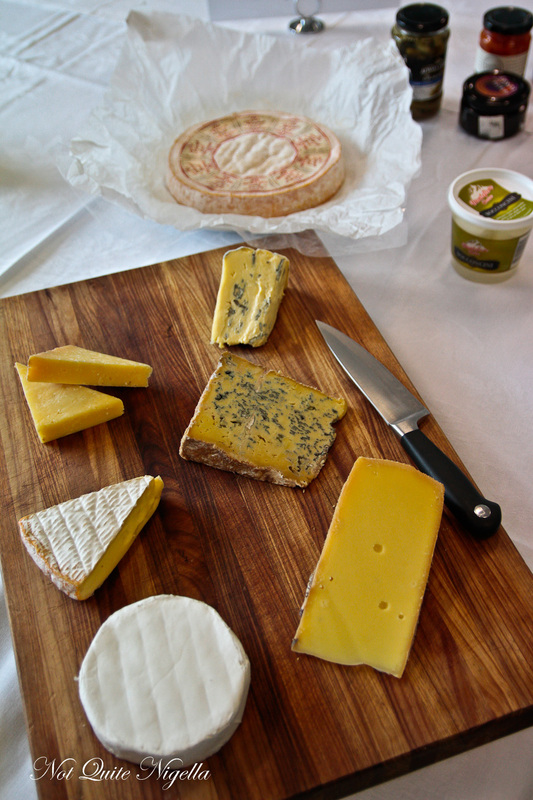 He comments that the cheeses and milks differ markedly from those back in Spain. We are called upstairs to evaluate the next class: flavoured yogurts. These are all presented around a table and unlike the milks, no two really appear the same. There's a longer length of time taken to evaluate appearance as there are almost fifty samples and each yogurt looks different. With appearance, I think to what a consumer might see when they see the yogurt-it is full? Does it look like the flavour it is supposed to look like? Does it look appealing? Underfilling is also an issue and this brings things back to a consumer standpoint. Consumers will notice if a container is noticeably underfilled when they first open it. 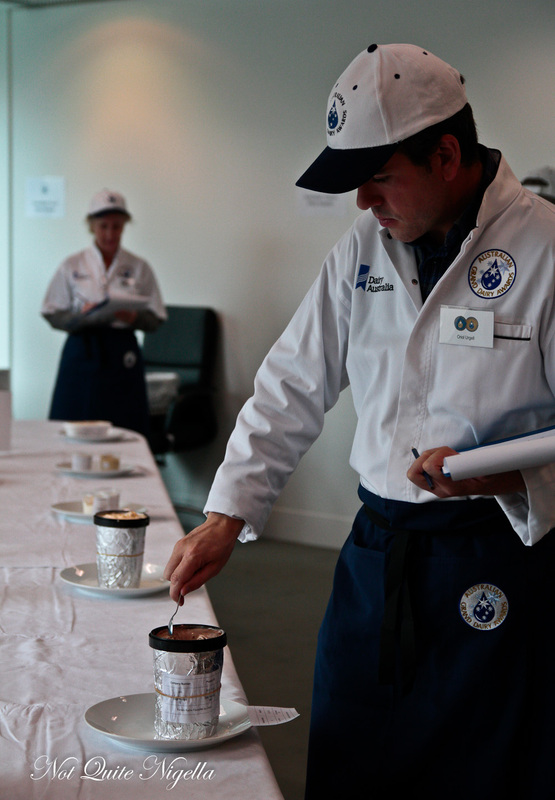 After the visual inspection, the stewards mix up the samples so that the flavours can be easily distributed. Some brands are vaguely recognisable from the containers and in this category there were some that didn't really feel like they would be gold medallists. Within flavoured yogurt, there's little emphasis on the tart tang of yogurt and the focus is more on whether the yogurt's promised flavour comes through strongly. 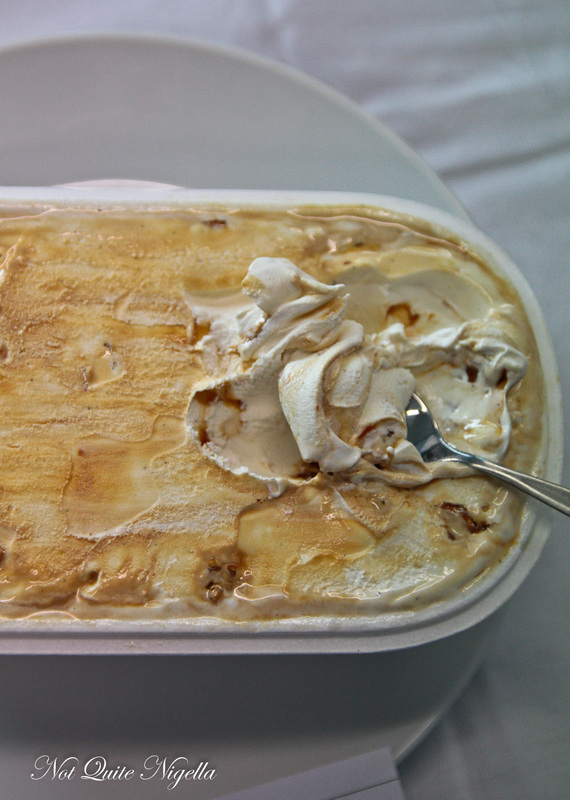 Our next category is understandably a favourite: ice cream. To avoid ice cream melting the 58 ice creams, tubs are brought out by the hard working stewards five at a time and are then removed from the room. 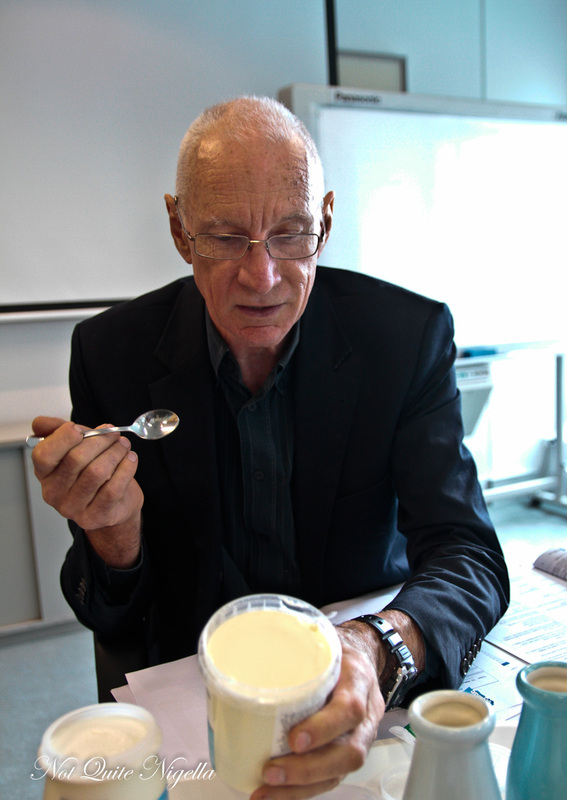 Clean spoons are constantly being topped up and we taste, spit and judge. This year there seems to be a lot of licorice and ginger entries and even within each, there is a wide variation particularly within the latter. There is one sample which gives a deep, rich ginger burn while others are sweeter with small pieces of crystallised stem ginger. Flavours like chocolate and coconut only have a few entries while there are some ice creams that are so delicious that you just want to take a peek under the foil to see what they are. 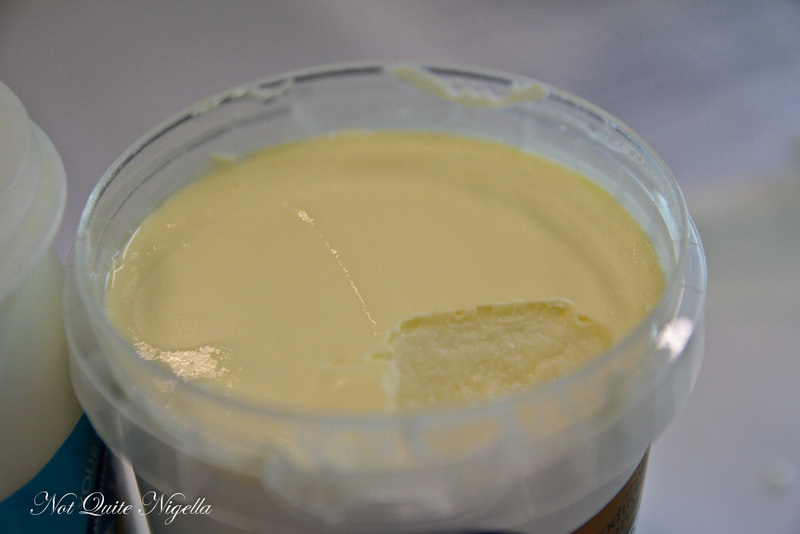 After the fun of the ice cream comes the butter. 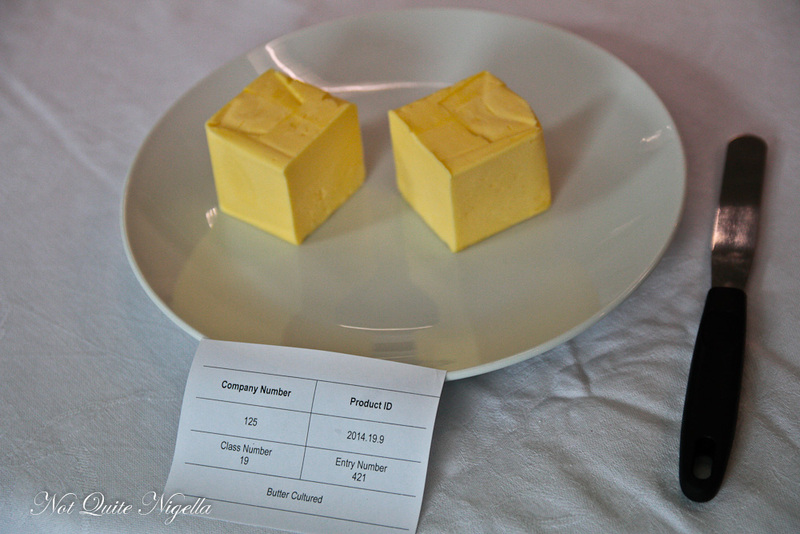 The blocks of butter are around 12°C/53.6°F in temperature plus or minus 2°C/35°F. This is an interesting tasting because most of us eat butter on bread but for the purposes of tasting butter, we are to cut a lump of butter from the larger block, swirl it around in our mouth while it melts and then spit it out. And even though this is unconventional in terms of the way that butter is eaten, it does give you a good appreciation for the flavour of the butter. 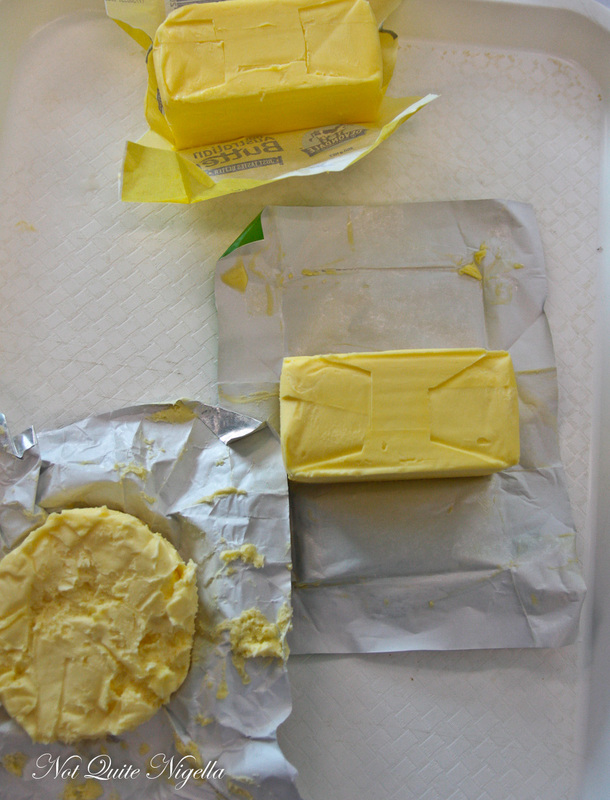 There are cultured, salted and unsalted butters and I find that within the small butter group of nine, there is a difference with some so salty that it is overwhelming while others are intensely creamy. There is a break for lunch, and by now, I am craving something clean and savoury like a salad or fish. 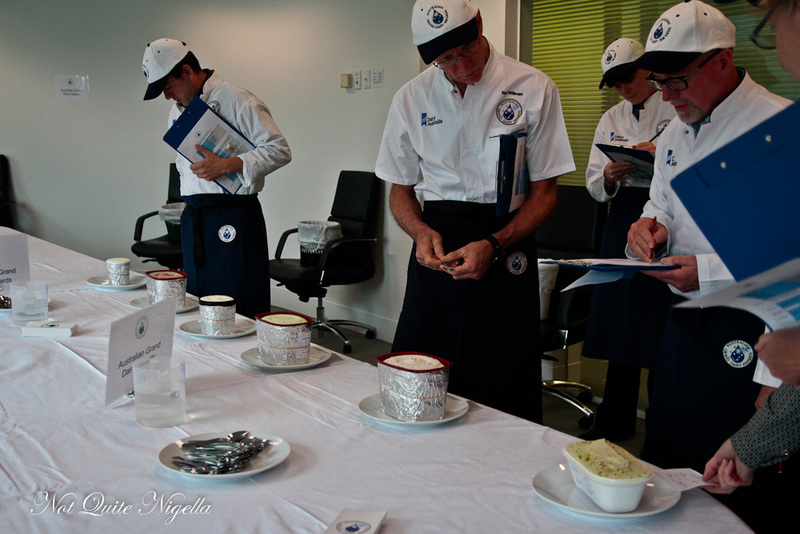 After lunch, the judging for natural yogurts and flavoured milks takes place with both groups being done together. The dairy dips are judged afterwards and they are dips that contain a minimum of 51% dairy whether it be cream cheese, sour cream or cream. Some are so good that it takes effort to spit them out. The final session of judging sees us tasting the top tier of the gelatos, creams and speciality white drinks (skim or modified milks) as voted by the other group. 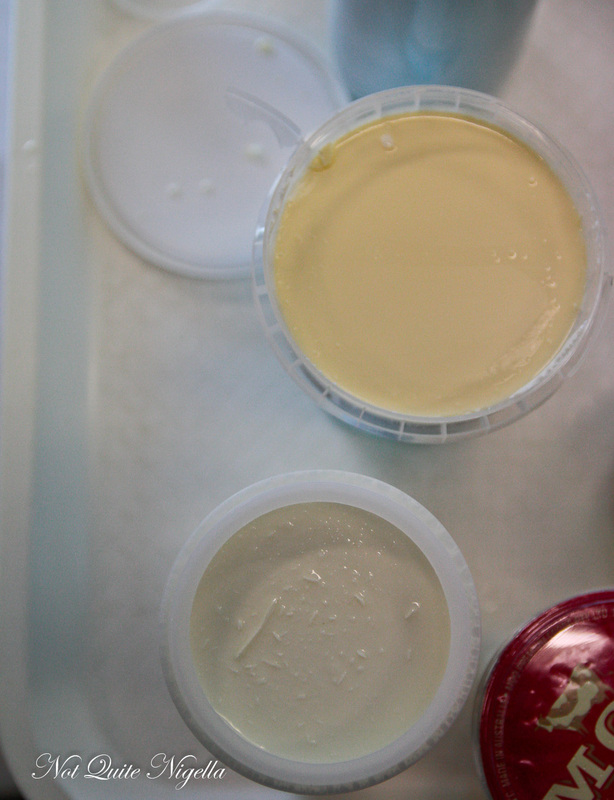 The dairy gelatos are superb, the textures are creamy and moreish. At the very end I take a piece of green apple and it tastes pure and refreshing. So tell me Dear Reader, would you enjoy being a food judge? And do those awards on the packaging influence whether you buy an item? featureThe 12 Days Of Christmas Gift Guide and Win An Olympus Camera! featureRescuing Food: A Day With OzHarvest! featureHow Much Food Is Wasted? Behind The Scenes of Food Bank! featureSix Lunches, Six People: What Do You Eat For Lunch? feature Rescuing Food: A Day With OzHarvest!